As violence, racism and fascism grow in the world and in our country, we need more than ever to find ways to live together peacefully. Please join Bob Connors, Tom Walker and John Dickman for the Peace & Justice Report this Wednesday and every Wednesday from 9-10 a.m. Tom is traveling in November, but Bob and John will be working hard to line up interesting guests each week. The quote above is from the website of one of our previous guests – Media Benjamin, and her organization Code PInk. 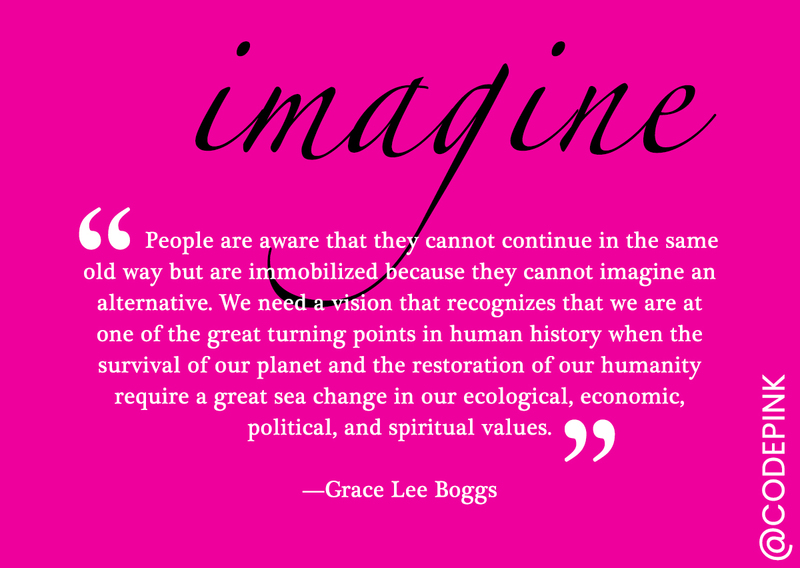 The quote is from Grace Lee Boggs, an American author, social activist, philosopher and feminist. Our second guest will be Adam Tebrugge, author of the blog Florida Criminal Justice Reform at srqcjr.blogspot.com. SARASOTA, FL – Sarasota County Supervisor of Elections Ron Turner offers the following information to voters to help ensure a smooth November 6 Election Day. Know what is on your ballot before you go to vote. Every voter may download a personalized sample ballot at SarasotaVotes.com. Additionally, a sample ballot has been mailed to every voter who has not requested a vote-by-mail ballot. Voters are encouraged to mark their choices on the sample ballot and take it into the voting booth to use as a reference guide when voting early or on Election Day. The last day of early voting is Saturday, November 3. Six sites, including the three elections offices in North Port (Biscayne Plaza), Venice (R.L. Anderson Administration Building), and Sarasota (Terrace Building), Fruitville Library, North Sarasota Library and Westfield Sarasota Square Mall, are open now through Saturday, November 3, from 8:30 a.m. to 6:30 p.m. daily. Voters may still request a vote-by-mail ballot by calling 941.861.8618. You will be asked to provide your name, birth date and the address to which you would like the ballot mailed. A request for a vote-by-mail ballot to be mailed to a voter must be received by 5 p.m. Wednesday, October 31. Completed vote-by-mail ballots may be returned by mail or in person but must be received by the elections office no later than 7 p.m. on Election Day to be counted. Post marks do not count. If in doubt, return your vote-by-mail ballot in person to one of the three elections offices in Sarasota, North Port, or Venice. The cost to return a ballot by mail is $.50 or one Forever Stamp. On Election Day a voter may vote only at the polling place in his or her assigned precinct. Polling place locations are identified on Voter Information Cards and online at SarasotaVotes.com. One may also call the elections office at 941.861.8619 for assistance. Polls are open from 7 a.m. to 7 p.m. on Election Day. Every voter must present current and valid photo and signature ID upon check-in at the polling place. A voter who does not produce ID will be offered a provisional ballot. A list of valid photo IDs can be found in the Voter Guide at SarasotaVotes.com. Important: If a photo ID does notinclude the voter’s signature, an additional ID that provides the signature shall be required. Have a question? Call the elections office at 941.861.8600 or visit SarasotaVotes.com.